An important aspect of the Emerald Shiner Project is outreach and education for the general public and water enthusiasts alike. By increasing awareness about the importance of the emerald shiners, and their critical role in the aquatic ecosystem, we ensure the protection and long term survival of this keystone species.  Buffalo State and Buffalo Niagara Riverkeeper are partnered to host various education events to teach the public about the emerald shiners, their habitat, and their contribution to the health of the Niagara River. Dr. Alicia Pérez-Fuentetaja, principal investigator of the Emerald Shiner Project was invited as an expert panelist for the International Joint Commission (IJC) public forum yesterday in Buffalo. The IJC is a joint committee between the US and Canada, which serves to advise federal decisions that affect our binational waters. This week they have been seeking public comment in Great Lakes cities, and providing a platform for local experts to share their work. 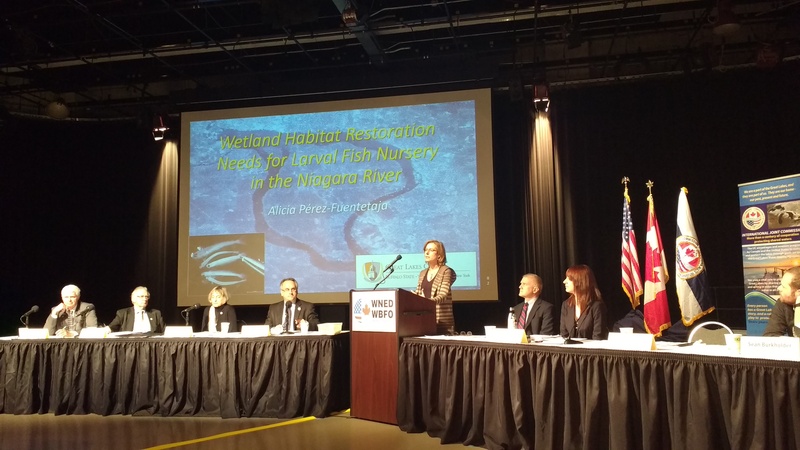 Dr. Pérez-Fuentetaja spoke about the importance of wetland habitat for larval fish in the upper Niagara River, and how vertical hard shorelines pose serious threats to aquatic wildlife. Thank you WBFO and Great Lakes Today for hosting! You can listen to the full meeting on their Facebook. The emerald shiners will be the featured theme for two kayak tours hosted by Buffalo Niagara RIVERKEEPER! Registration is required for the River Tours. They will launch from the Great Lakes Center Field Station on July 14th and August 11th. Jo will speak to the paddlers about the importance of emerald shiners, and the reasons we are studying them. The Young Environmental Leaders Program (YELP) is a unique education program offered to Buffalo Public Schools students residing in underserved communities. These high school students interested in the sciences are able to learn about local environmental issues in a curriculum taught by Buffalo Niagara Riverkeeper in partnership with South Park High School and Riverside Institute of Technology. This was the second time emerald shiners were a featured class lesson for YELP students. This year, each student was assigned an aquatic species, and they passed around a ball of yarn to visualize how interconnected the food web is. Then Jo gave a presentation to the students about the special role that emerald shiners play in the food web. The students were able to see emerald shiners first hand in the tanks at our field station, and learn about some of the equipment we use in our labs. Lastly we took the students out on the water for a paddle tour, and they saw common terns catching emerald shiners out on the water. The Buffalo News wrote a great article summarizing our research project and all the collaborators who play a role. You can learn more about the Emerald Shiner Project, and main goals of our research by reading the article! Jake and Jo were featured on Outdoor Beat! This local television show, hosted by Bill Hilts Jr., features many local researchers, conservationists, outdoorsmen, and anglers. We were so excited for this opportunity to spread the word about our research on emerald shiners! Watch this video! Come join us at the Aquarium of Niagara on March 31st for a free event organized by Buffalo Niagara RIVERKEEPER. This event features four different scientists discussing their fisheries work in our watershed. One of our graduate students, Jo Johnson, will be giving a presentation on the Emerald Shiner Project! The event includes free admission to the aquarium. Registration required! There's about 25 spots left. Steve, Colleen and Jo were featured in the latest Great Lakes Center newsletter. On August 26th New York Sea Grant sponsored Great Lakes Awareness Day at the Aquarium of Niagara in Niagara Falls. The Emerald Shiner Project shared a table with Buffalo Niagara Riverkeeper, and spent the afternoon teaching the public about the native and invasive dynamics in the Great Lakes. Jo distributed flyers about the emerald shiners and explained their role in the food web. The other local organizations present were: New York Sea Grant, U.S. Fish and Wildlife Services, Western New York Partnership for Regional Invasive Species Management (WNY PRISM), and Reinstein Woods Nature Preserve. June 27th was Family Fishing Day at the Black Rock Canal Park. The last weekend of June is a fishing weekend event, where the New York Department of Environmental Conservation allows anyone to fish without a permit. 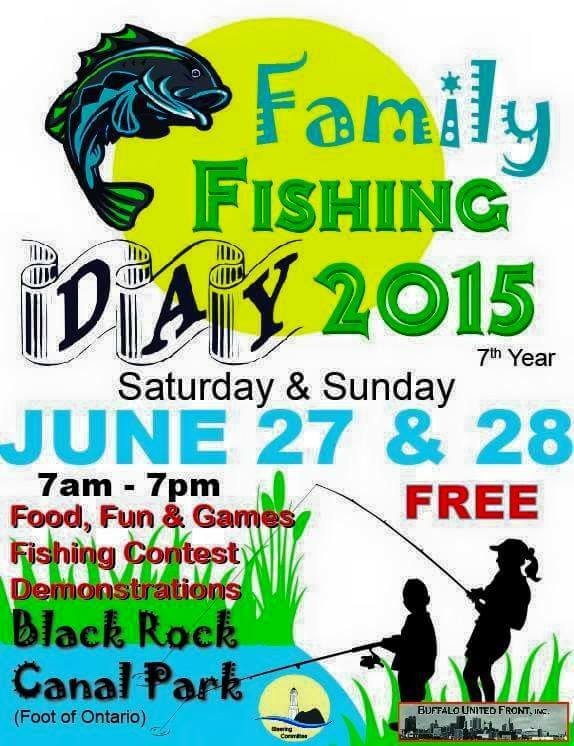 Buffalo United Front Inc. hosts Family Fishing Day here in Buffalo, NY. They barbequed food for the public, and gave out free fishing poles to children. This year we passed out pamphlets on the emerald shiners and answered questions about this important native baitfish. Our friends at Buffalo Niagara RIVERKEEPER were there with us teaching about proper cleaning and safe eating of local fish, the role of native plants, and their fish passage restoration projects. Although it was a very rainy day, it was still a blast! In June 2015 the YELP students went kayaking in the Niagara River to learn about the emerald shiners. This class emphasized the importance of the emerald shiners and its role as a keystone species. The students learned about the shiners' contribution to the food web and the ecological context of the research project. They were able to watch common terns on the water firsthand, a bird that relies almost solely on the shiners for its diet. The common tern is a threatened species in New York State. Jake, John, Chris and Steve were featured in two Great Lakes Center newsletters! You can read more about the project and their perspectives here.